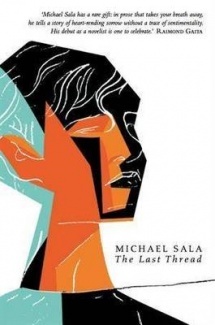 Michael Sala’s The Last Thread has just won the 2013 Commonwealth Regional Book Prize. I haven’t read it myself, but Sue at Whispering Gums has, and you can read her review here. Michael will now represent Australia and the Pacific region in vying for the main Commonwealth Book Prize, which will be awarded for the best first book of 2012, and announced on 31 May at the Hay Festival in Wales. Maintaining a proud Australian tradition of success in this award, The Last Thread joins notable recent Regional award winners: Me and Mr Booker by Cory Taylor (Text Publishing) in 2012; That Deadman Dance by Kim Scott (Picador) in 2011; and The Slap by Christos Tsiolkas (Allen & Unwin) in 2009. Congratulations to both author and publisher! Thanks for the link Lisa … I too got notification of this award but decided to wait writing my post until we got back today. I really hate writing posts while I’m travelling. They always seem to take twice as long! I know what you mean, I can do it ok if I have my own laptop, and if I have good reliable and not too expensive internet access, but otherwise, I agree, it’s too hard! Oh Lisa thanks, and yet you do a great job when you are travelling. I’m always impressed by how much you manage to blog on your trips. Or do you travel with your own laptop? Of course the internet access is important too! Last time was easy because yes, I took my laptop, and Russia has high speed internet everywhere and it’s cheap. But on the trip before that, especially in France, it was woeful and often the iPad was the only thing that would connect, and I cannot bear typing on an iPad. And here in Australia where internet access outside the cities is sooooo bad, I often give up entirely, e.g. in the Hunter Valley, down on the south coast, parts of Tassie etc etc. Bring on the NBN! We are thinking of getting a little MacAir for our next trip … that will be closer to my normal environment and will make it easier for me (if we end up going that way) but yes, isn’t access woeful around Australia even in big country towns. I was stunned when I found how bad it was in the Hunter. Actually quite scary when it’s bushfire season and you’re staying off the beaten track as we were. Oh yes, I remember now you’re commenting on that when you were there.